Wouldn’t it be great if your house paid for itself? As the largest investment most people ever make, wouldn’t it be nice if your home carried its own weight? 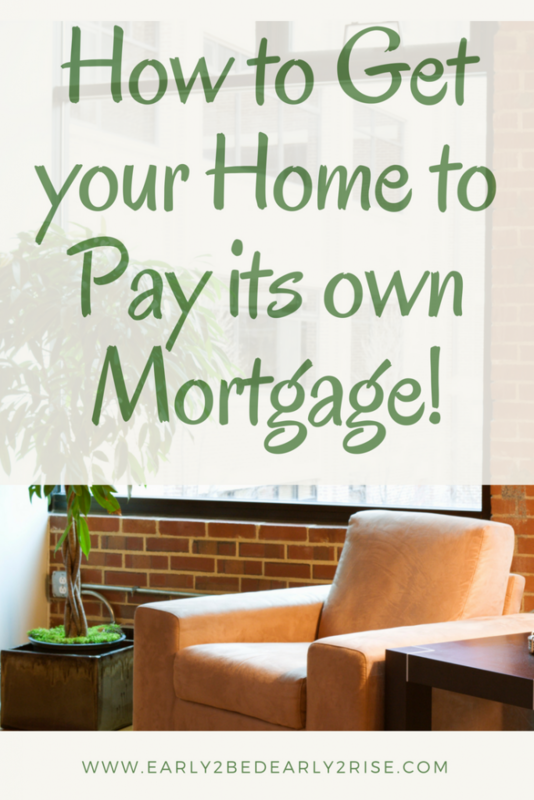 You can take advantage of these great ways to help your house pay for itself! The income potential from these ideas in many cases can cover a mortgage payment so that these housing hacks can let you live for free. Some of these suggestions may be better suited for your stage and season of life than others, so keep an open mind while you read. Also, I’d love to hear your housing hack suggestions and tweaks, especially if you can tailor some of these ideas to your own situation. Do you live near a popular sports team? This one can be a quick way to make some cash! When we were newlyweds, we used to live near a large university, which shall remain nameless, but they won the football National Championship recently and they wear a lot of orange! We rented out our little house as a game-day rental, and it was a very lucrative side hustle. Rental rates can be two to three times higher than average nightly rental when there’s a special event going on. Renting out your home when there’s a sports game or other large event, like a concert or such, in town can really add up. You can also require a certain minimum stay, which puts more money in your pocket. Now, I would totally recommend going with Airbnb!! It’s an easy way to advertise your pad, work with potential guests, and to ensure a deposit and cleaning fee (this is essential!!!). You can sign up for Airbnb HERE by clicking on “Become a Host,” and as an added bonus, save $40 on your next trip (maybe you can use this for a cheap vacation while you rent out your pad!). To maximize your Airbnb income, Hosting Your Pad is a fabulous course that will teach you step by step how to become a Super Host!! You could make back the cost of the course with just one Airbnb guest, and you could potentially earn hundreds of dollars a month! This is one classic option. If you have a dedicated rental suite, you can rent out the entire, separate space to a tenant. You’ll probably want to manage it yourself since you’ll be living just next store or sharing some walls with your tenant. You can also look into getting a roommate who stays for a set amount of time. You usually share come spaces, and be sure to outline the anticipated living situation so there’s no surprises for who’s expected to clean the bathroom or other shared spaces. You can also use a property manager to help you find and screen appropriate tenants for your space. You usually need to pay them a finder’s fee, but this can be a great investment to help you get an ideal tenant. It’s a good idea to get references and a credit check on your potential tenant to ensure that this is the right fit for you and a good rent for them. It’s also important to have a security deposit (usually one month’s rent) to hold in case incidental damages should occur. You can also open your home up for short term rentals through Airbnb or another home rental site. Hosting Your Pad is a fantastic resource to teach you how to maximize your short term rental income. 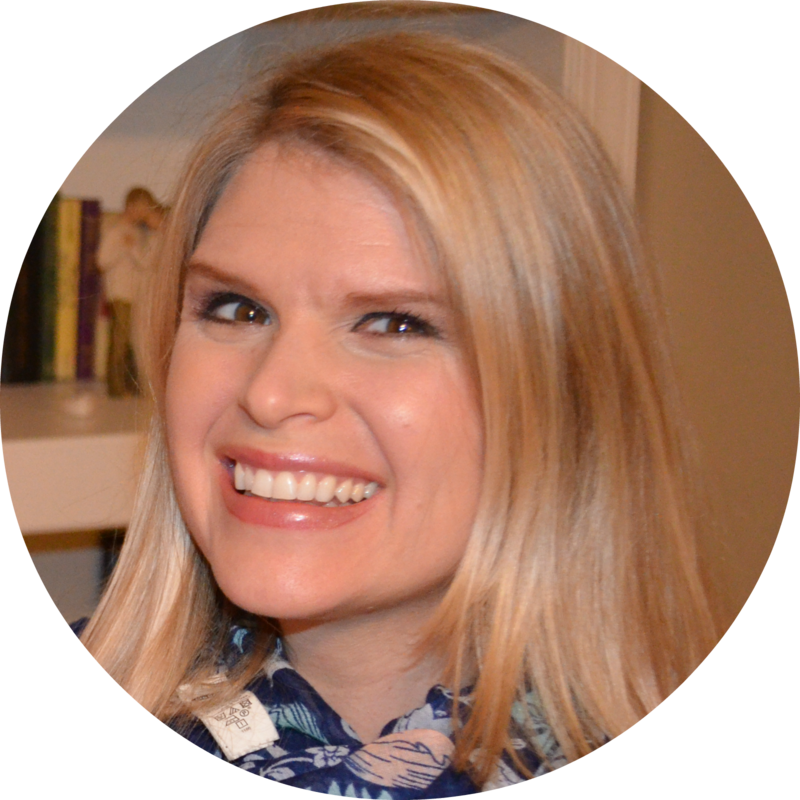 It’s all the tips and tricks that my blogger friend Katie, an Airbnb Super Host, used to make thousands with Airbnb in her very first month! Additionally, be sure to check into local regulations with your community’s HOA and local city ordinances to comply with their standards before you offer your place up for rent. Some HOAs don’t allow short term rentals (like Airbnb), and some cities that rely heavily on tourism have fines in place if you pursue type of rental. Did you know that you can become a pet sitter from home? You can offer to board animals for their owners while they’re away. As with any of these options, you need to make sure that this is a good fit for you. For example, if you hate pets or your giant dog hates other animals, don’t do this one. You might want to use a website like rover.com or nextdoor.com to advertise your services. Beware, though, that these sites may charge a percentage of your fee if you secure a gig through them. Check out more details about pet sitting from this awesome article. Your Garage— Decades ago, my parents lived in a small town while my dad was in grad school. Their little rental house came with a garage, but they didn’t own a car. So, they made an extra $10 a month (lol, it was the ’60’s) renting out their garage. You can rent yours out to someone how needs space for their vehicle or just as a storage space. I’m pretty sure the going rate is more than $10 these days! You get more details and advertise at JustPark.com if you’re interested. A Storage Shed— Like renting out your garage, this can be an easy way to make some cash! If you’ve got the space, someone can store their extra stuff in your shed. You won’t have to see it, and you’ll get some extra moola to pay down that mortgage! This one is my absolute favorite! Did you know that you can rent out your house to a movie company?! Sometimes a movie or TV show is looking for the perfect fit for the setting of that show. Your home doesn’t need to be a mansion or the model home in your neighborhood. Sometimes a show is looking for a cozy pad or quirky residence that’s a perfect fit for their characters. As an added bonus, the movie or show usually puts you and your family up in a hotel when the filming occurs. You can get a fun “stay-cation” out of the deal as well as getting to see your famous house on the big screen some day! I’m totally applying for this as soon as we finish our home reno projects (lol, I thought they might prefer a finished kitchen backsplash over our current unfinished sheetrock!). If you’ve got some land, you can rent out garden space! Veggies make great, quiet roomies, and you’ll love the extra dough that they bring in every month. Did you know that there’s an option with Airbnb to rent your yard as a camp site rental? Lol, you could be the local KOA! This is especially ideal for people with some land, no HOA restrictions, and if you live close to a national park or other popular scenic locale. Okay, this one involves more effort than simply owning a home. But, if you have a home office space, you can use it as your quiet, work-from-home retreat. There are so many great side hustles that you can start up from your home office! You can become a Virtual Assistant and help a blogger grow their business. You can write articles for Textbroker or another online writing site and get paid this week. You can answer surveys and help companies grow. Respondent has my favorite surveys— they pay $25-$350 per survey!!! You can watch videos, do surveys, play games, and surf the web with Swagbucks! You even get $3 FREE when you sign up through my link! 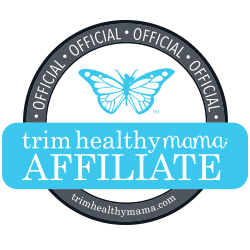 Woohoo– you’ll make money right away! I even used Swagbucks as a quick way to pay for all of our Christmas presents one year. You can coordinate your inflatable real estate business from here– check out how this guy does it! This is the coolest side hustle that I’ve heard of in a long time! If you make enough from your hard work to make money at home, you can possibly count your home office and internet expenses as a tax deduction! Saving money can be a great way to make money! 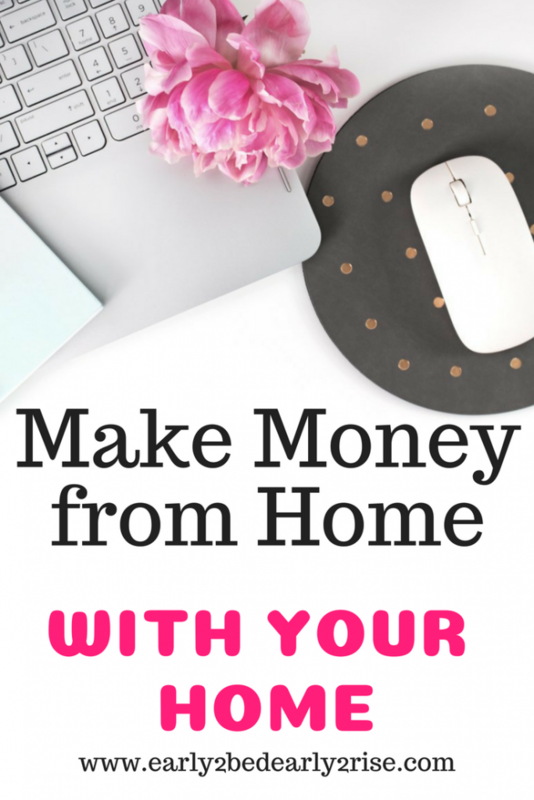 Did this list spark your interest in making money from home? 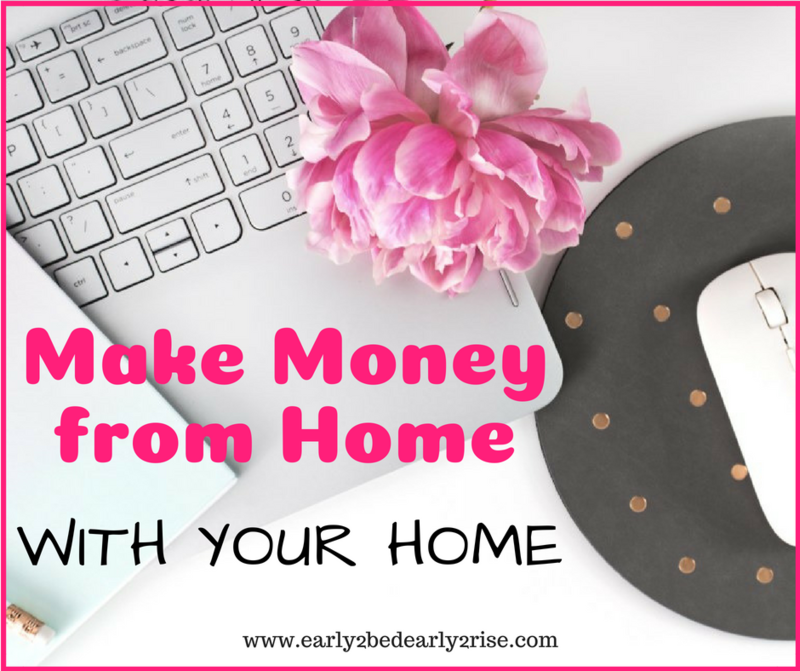 For even more ideas and plans to get your home business rolling, check out this amazing resource from 37 work-at-home experts that discusses of 150 ways to make money from home! Walmart Grocery Pick Up– This makes my life soooo much easier! You place an order, they shop for you, and then they load it into your car when it’s time to pick it up. I save time not having to shop, I save money by not making impulse buys in the store, and it saves my sanity not loading up two small kiddos into a shopping cart. If you haven’t tried it yet, get FREE groceries by using this link to get $10 off your first order! Get $40 Off Your Next Trip- Save $40 off your next trip with Airbnb when you sign up for a new account HERE! I love saving money and I love traveling, so this lets you do both for the best vacation ever! Personally, I would use this for a short, close stay somewhere in the off season to enjoy a mini-staycation that we wouldn’t otherwise take! It’ll recharge your batteries and refresh your view of where you live. Set Yourself Up For a Healthy Bank Account- Personal Capital is such an amazing resource! This FREE service lets you combine all of your banking accounts (including stuff like your mortgage and retirement accounts) so that you can keep tabs on your finances at a glance! Get a $20 Amazon gift card for trying it out for FREE here! These are great tips! I don’t yet own a home, but this is definitely something to keep in mind when that time comes. Awesome post! I had never thought of these ways to make money before! These are such good ideas! I never knew that many of these sites existed! Especially the sites for renting out your parking! Great post! These are great ideas! I’m hoping to section off an area of my yard for veggies. Never thought about renting the space out to make money! Great content. I never thought of opening my home to a movie or show for filming and I am in California so that may actually happen. Thanks for the tips. Great ideas! I seriously wish our rental allowed us to do air bnb as we live in a cool setting, but we can’t. Another option instead of the Airbnb camping option is harvest hosts and WWOOFUSA. These are all such great suggestions!